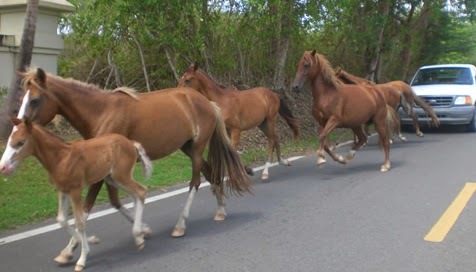 One of the many beauties of Puerto Rico is that horses (among other types of animals) roam the land free. You may see a horse crossing in front of your house, at a stop sign, across an open field, really anywhere, anytime. Sometimes they are being ridden or put out to pasture or they are wild and just doing there “horse thing”. One of the byproducts of free-range horses is their manure deposits; again, at anywhere and at anytime. This morning as I was hyperventilating on my morning jog up a nearby hill, I spotted a horse manure pile up ahead right smack dab in the middle of my narrow path that runs close to a busy street. It was large, with multiple flies congregating around it, and it was downwind from me so it provided a distinct odor for which I was unable to avoid smelling by holding my breath since I was already in such short supply. With little time to contemplate how to go about maneuvering around it without tripping and falling either into the manure pile or into the street, I was able to successfully and carefully avoid both possibilities without breaking my stride. Then God gave me a light bulb moment (yes, God spoke to me as I avoided falling in a pile of manure)! On this narrow path that Christians travel on together how times do encounter a “manure pile” in our path? The road is “straight and narrow” so there is little leeway for circumventing stumbling blocks. When we encounter a stumbling block left by a fellow believer it is never pleasant, normally we curl up our nostrils in disgust as we are forced to take in its stench, it surely is not visually appealing either, and sometimes we see others ensnared in it as well. What do you do? There are a few scenarios that you can choose from: you could quickly look for a way to avoid tripping and falling into their “manure pile” and successfully avoid it and then continue on your way happy and praising yourself for your skills in avoiding entrapment! You could also stop and complain about it while pointing it to others as they pass by and exclaim how nasty and dirty it is proclaiming, “Unclean unclean unclean!”. You could also recruit someone to clean it up and get it out of the way for you in an effort to remain clean. Also, you could simply ignore it, pretend it doesn’t bother you and practice the “mind over matter” technique because who has time these days to deal with such annoyances that will only bog you down and ruin such a nice day? Or…. you could face the problem of the stinky pile; help the “depositor” of said manure pile clean it up while showing them how to properly take care of it for the next time. Hmmm, so many choices, wouldn't you say? You know there is a flip side to this analogy as well! Until we reach the end of our path to Heaven we will never stop encountering “manure piles” or…..wait for it…..making them ourselves. Manure piles are a fact of life even on the straight and narrow path with other believers. We all do it and won’t stop doing it until we are fully transformed. So for now, as we traverse this path together in our tents of flesh, what about you? Sanctification is rarely pleasant, just like cleaning up a pile of manure. And, sometimes we get the added bonus of helping out someone else bear their burdens and giving them a little extra push along the way so they can overcome their own stumbling blocks. Manure is manure, we all do it. The only difference is: what will we do when we do it ourselves and what do we do when we encounter someone else’s pile?